Mido is on of those illustrious Swiss watch brands for people in the know. Founded in Switzerland in 1918 by George Schaeren, Mido is today based in Le Locle in the heart of the Swiss Jura Mountains. The name Mido comes from the Spanish “Yo mido” meaning “I measure” For nearly a century, Mido has been a global benchmark in Swiss mad mechanical watches.Mido has announced a new watch specifically aimed at football fans. With the new Multifort Touchdown Special Edition, the company’s aim is to assert their dedication to football. 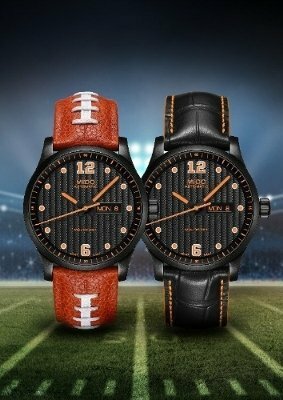 Both football fans and enthusiasts of fine Swiss watchmaking mechanisms can appreciate it. Its sporty but made to perform. The makers of Mido state that the Multifort Touchdown Special Edition timepiece is meant to celebrate power and precision, two essential qualities on the football field. Its robust black PVD-treated steel case shelters it from the roughest impacts. Measuring 42 mm in diameter, it houses a magnificent black dial that is decorated with vertical Geneva stripes and protected by a sapphire crystal with an anti-reflective treatment on both sides. The orange numerals 6 and 12 recall the numbers that adorn the players’ jerseys and feature generous touches of orange Super-LumiNova® for increased legibility at night, as do the index dots and the hour and minute hands. The black and orange hands are another nod to football, and in particular to the first down marker. The watch has two interchangeable straps to make it more adaptable for the wearer. The “Game Day” version in Horween® leather with central white lacing is inspired by the legendary football itself and borrows both its design and material. It is fitted with a pin buckle designed to evoke a goalpost. Meanwhile, the “Weekday” version in black leather with orange topstitching recalls the Mido colors, making it a timepiece with a sport-chic feel. This last strap features a black PVD-treated steel folding clasp. At the cutting edge of innovation, the Caliber 80 gives it exceptional autonomy: up to 80 hours of power reserve. The transparent case back enables this finely decorated movement to be admired, together with its oscillating weight, which is decorated with Geneva stripes and the Mido logo. The Multifort Touchdown Special Edition comes in a special box and is available for purchase in September for $1,150. For more information, visit us.shopmido.com.